#297 Can You Exercise Too Much? Most people would be thrilled to have their doctor tell them that they shouldn’t exercise too much. Can you really exercise too much? In this article, I’ll share the latest research findings on exercise with regards to lifespan, brain health, and arrhythmias. As we discussed in our best selling book, The Longevity Plan, at the cellular level studies show that exercise adds 10 years to your lifespan. The great thing about these extra years is that these years gained from exercising are high-quality years. In other words, the fitter you are the less likely you are to have poor health at the end of your life. Indeed, this is what I see in my cardiology practice. People who exercised faithfully throughout their mid-adult lives are often the same people who are still skiing, cycling, and going to the gym in their 80s, 90s, and beyond. This finding fits well with the compression of morbidity hypothesis which states that proper maintenance care now may eliminate or minimize the sick years at the end of life. Is There an Upper Limit to Exercise and Longevity? While some people have argued that it is possible you can exercise too much, the most recent research suggests that you can’t exercise too much when it comes to longevity. Indeed, in a recently published JAMA study on 122,007 people showed that the farther a middle age person can go on a treadmill at their doctor’s office the longer they will live. To get the maximum life expectancy in this study you had to be in the 95th percentile of people your age for physical fitness. And if you could achieve this 95th percentile, then you lived 80% longer. What’s Worse, Smoking or Not Exercising? While everyone knows that smoking is bad, few people quibble over missing a few workouts. However, these missed workouts may actually be worse for you than smoking according to this same study. The truth is that if you want a long life free of disease and heart problems, you have to do something for exercise every day. No excuses. How Do You Exercise with Bad Knees, a Bad Back, or Bad Whatever? While most people are quick to come up with an excuse as to why they can’t exercise, Michele no longer believes these excuses. Michele is a 78-year-old patient of mine with atrial fibrillation. In addition to atrial fibrillation, Michele also has multiple sclerosis (MS) and is confined to a wheelchair. Not only is she stuck in a wheelchair but MS left her so tired that she didn’t have any energy to exercise. If anyone had an excuse not to exercise it was Michele. When Michele and I discussed the importance of exercising to prevent her atrial fibrillation from worsening, she came to realize that not being able to exercise was really just an excuse she chose to believe. Together we explored how she could exercise given her challenges. With a few Google searches, she was quickly able to learn how to do wheelchair yoga and weightlifting. She also invested in an upper body exercise bike that she could pedal with her arms while watching TV. She made exercise a daily habit, which then led to healthier eating, natural weight loss, better sleep at night, and a whole new view of the stresses in her life. The end result was that her atrial fibrillation went into remission and she no longer needed my help as a cardiologist. The key point here is that everyone can do something for exercise. If your knees or back hurt try cycling, water aerobics, or swimming. And if these exercises don’t work for you then explore other ways to exercise daily. What is the Best Exercise for Longevity? When it comes to the best exercise my answer is always the one you like. I answer this way because I know if you enjoy it then you will be more likely to stick with it. To this I respond, “then find something you like.” As there are thousands of different ways you can move your body I am confident you will find something you can learn to like. However, if you want to take things to the next level, a recent study of 8,577 people showed that the more social interaction you get with exercise the longer you’ll live. This finding makes sense and fits well with other research. A leading researcher in the field of loneliness and longevity, Dr. Juliane Holt-Lundstad, has shown that social connection may be more important for longevity than how much you weigh or whether or not you smoke. With my busy schedule at the hospital, it is hard for me to exercise with other people when I’m trying to get in a workout at four or five o’clock in the morning. However, on the days I am off, I can choose to exercise with my family. As a family, we love bike rides, hikes, and ski days together. Exercise is fertilizer for your brain. Indeed it is one of the most potent stimulators of brain-derived neurotrophic factor (BDNF), as I discussed in this article. And the more of this BDNF you have the better brain you’ll have. One interesting study showed that for middle age people if you can get into the top level of fitness for people your age you can drive your long-term dementia risk down close to zero (88% reduction). Thus, as with longevity, research suggests that you also can’t exercise too much when it comes to dementia prevention. Can Too Much Exercise Cause Arrhythmias? Having made it this far in the article, it seems like there is no limit to the benefit you can get from exercise. The one exception may be with arrhythmias. Perhaps you can exercise too much when it comes to cardiac arrhythmias. While 99% of my patients don’t have to worry about getting too much exercise, there is a small subset that does. Indeed, many studies have confirmed that extreme levels of physical fitness, like training for the Ironman World Championship, elite ultramarathon runners, or Tour de France riders, may be at increased risk of atrial fibrillation. Before you start dialing back your exercise, a study just published in JAMA showed that even among elite athletes atrial fibrillation was a rare occurrence. Although the increased risk was low, older athletes who have competed for many years and who also have an enlarged left atrium seem to be the most at risk from this study. As exercise is so critical for optimal brain function, health, and longevity, most of my elite athletes with atrial fibrillation usually opt to just get it fixed with a catheter ablation procedure. For these people, they can’t compete on all the cardiac drugs so they are looking for non-pharmacologic solutions to their arrhythmias. While everyone knows exercise is important, studies show that only 5% of Americans exercise regularly when you look at accelerometer studies. Why is it that only one in every 20 Americans can make the daily exercise habit stick? They need a reason to exercise. Exercise isn’t easy and if you don’t have a compelling reason to exercise it makes it even harder. For me, exercise is my daily antidepressant. Without it I am miserable and no one enjoys being around me. If you are going to make exercise a daily habit you need the right environment. You need friends that exercise. And if you don’t have any exercising friends then find some at your local gym or community meet up. Selling one of your cars is a fantastic way to change your environment to exercise more (not to mention the fact that you would also save a ton of money). Less drastic measures could be setting out the right exercise gear before you go to bed at night. If your workout clothes are all laid out before you then when you wake up in the morning the path of least resistance will be to exercise. You have to be accountable to someone or something. Perhaps it is your workout partner or a trainer at the gym. It could even be an app on your phone. In my case, I have recorded every workout in my iPhone for the last six years. For me, it is the app on my phone that keeps me accountable. How do You Prevent Exercise Injuries? Once I hit age 40 I found that I had to cross train. My body simply wouldn’t allow me to do the same exercise every day. I have to mix it up or I get injured. To prevent injuries, my advice is simple. Mix it up. If you go to the gym, attend many different workout classes. If you exercise outside, like me, mix it up with cycling, hiking, running, skiing, paddle boarding, etc. Last month I finally cashed in the Delta Airlines frequent flyer miles and took my family on a free trip to the north shore of Oahu. The best part about vacations for me is the opportunity to spend most of the day being physically active. 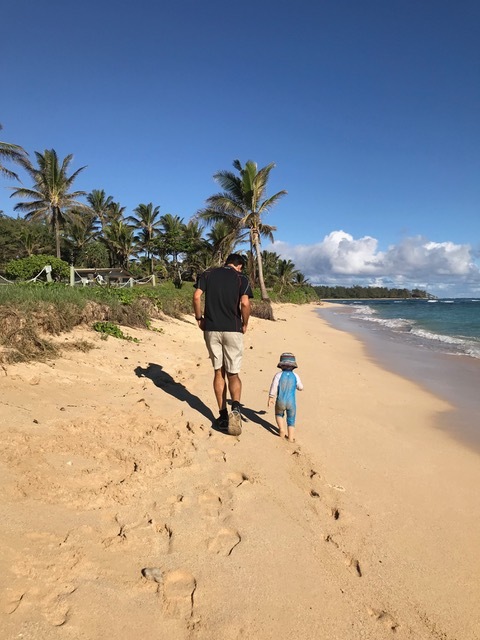 In this photo, I am running on the beach with my two-year-old son. From the moment our children learn to walk, we try to keep them physically active every day. While daily exercise is the right decision for more than 99.9% of my patients, there are rare situations where exercise may not be advisable. Check in with your doctor first to make sure you don’t have any exercise restrictions that might put you at risk. Great work, Doc, and team. Keep it up. Merry Xmas. To me walking, swimming, doing yoga, and cycling is a way of life and has been so for the past 65 years (I am now 80 years old). I was born with a congenital heart condition: a hole in the heart which grew larger as I got older and finally at age 49 I had it corrected. So now I had atrial fibrillation, which was controlled. This did not prevent me from my activities. I have always had dogs to walk, stairs in the house to climb and as a teacher I also developed and participated in a fitness/P.E. program for my students. Three years ago I had endometrial cancer, caught very early, followed by surgery and within the month I was almost back to my old self. Two years ago I had the tri-cuspid valve replaced (an 8 hour surgery) which was successful; although the surgeon couldn’t eliminate my atrial fib; so I take Warfarin, (which I have done for the past 25 years). It is easy for me to control. I also have a wonderful cardiologist, family doctor and gynecologist. My husband, children, sister and dogs are very supportive and I have a lot of friends. I have organized senior groups, walking groups and I am a volunteer cashier in a thrift store. I also have Irritable bowel, reflux, I wear glasses and hearing aides. And I still continue my exercise regime. I feel so fortunate to have made it this far and every year is a gift. It really is about attitude and being responsible for your own well-being. I have noticed huge improvements in my general health and my a fib in the last 3 years of adding daily exercise and eating healthier. The a fib hasn’t raised its ugly head in 7 mo now and I’m back to only taking rhythm med and beta blocker as needed. My mood is also better. Im 45 lb down and need to drop another 45 to reach normal bmi. Im 65, quality of life is more important to me than quantity, but I will settle for both, lol! If increasing your exercise promotes longevity will exercising too much increase your heart beats per min(while exercising)? If your heart beats more than 80-90 BPMs that would mean that longevity would be decreased based on your prior article. Maybe someone can explain the trade off? Lance Armstrong had a Vo2max/weight of about 70. Most people no matter how much they train cannot get their VO2 max above 55. The ability to improve the VO2 max varies person to person regardless of how much they train or exercise. Sadly. thousands of people divided up into five or six groups and ask each person to exercise the prescribed amount for 40 years to determine the ideal amount of exercise and the amount that was excessive. This study will never be done.